Belitung Island is famous for nature tourism. That means you can find many stunning beaches, gorgeous mountains, beautiful lakes, etc. However, it is also the home of several monasteries. In Damar District, you can find Sun Go Kong Temple. 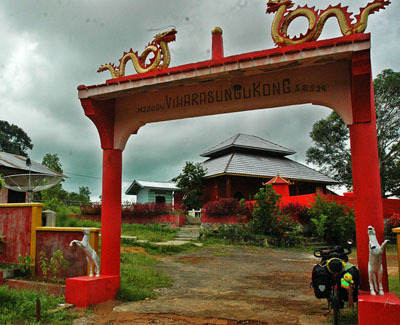 For those who visit Burung Mandi Beach, this beautiful temple should be the next destination. It is because the distance is only about 2 km. Both the uniqueness and accessibility become the main attractions of this monastery. Not to mention it is surrounded by a calm environment. The most noticeable thing is the gate. It has the combination of red and yellow color. In both sides of the gate, you can find statues of horses. On the top of the gate, there are two dragon statues. They face to each other. The building is a little bit bigger than other monasteries in Belitung. This area is surrounded by different types of trees. These include coconut trees, grasses, etc. In some occasions, several dogs come to this location. No worries. They are tame. Overall, Sun Go Kong Temple is quite attractive. Also, the interior emits distinct beauty. Once you enter the monastery, you can see the main attraction. It is Sun Go Kong Statue. He is the God of Monkey. Near to this statue, there is his famous weapon. The name is Ruyi Jingu Bang. According to the locals, this magic wand has the weight of 8,100 kg. Go Kong was recognized as a stubborn God. Even though he is powerful, he is wild and egoistic. As the name suggests, the temple was built to worship Sun Go Kong. No one knows why people in Belitung worshiped this stubborn God. Regardless of the reasons, the monastery becomes a unique lure in Damar District. Here is the thing. It is situated near to Kwam Im Temple. Thus, you can visit both of them at one go. Even though Sun Go Kong Monastery has lesser visitors than its neighbor, it is worth a visit. In fact, the government has conducted some improvements on it. According to the keeper, more tourists come to Sun Go Kong Temple over time. It is good news. That means the monastery has regained popularity. Before visiting the temple, you must make some preparations. For example, you must carry a camera. Visitors are allowed to take pictures either outside or inside the temple. The best object to capture is definitely that majestic monkey statue. Once you explore the monastery, you may continue your trip to nearby tourist spots. Your primary destination is Damar District. If you come from Tanjung Pandan City, the trip takes less than 2 hours. It depends on the type of vehicle. A rented car is the best choice. It also becomes the fastest option. The distance is about 75 km. Thus, you may expect a long trip. The fastest route from Tanjung Pandan is Bandara-Manggar Street. Make sure you use a comfortable vehicle!